A prominent feature that has become a tourist icon. The introduction of the omnibus in London is credited to George Shilliber in 1829. In 1933 all buses were bought under the control of London Transport. Since 1984 the situation has reversed and routes have been put out to tender, although buses running in Central London are still required to be red. Routemasters were introduced around 1960 but despite their popularity and the efforts of the 'Save the Routemaster Campaign' group [website] their service on regular routes has finished. There are however two 'heritage' services (Trafalgar Square to Tower Hill & Royal Albert Hall to Aldwych). The newest buses are the so-called Bendy Buses with 3-door entry. Bus travel is good value for money with a one-day bus pass costing only £3.50 and it provides a leisurely way of getting around (ie it's not so good if you're in a hurry!). North of the Thames the number 11 passes major sites between Liverpool Street and Chelsea and the RV1 between Covent Garden and Tower Gateway serves 47 attractions, many south of the river. The TfL website covers all aspects of travel by public transport in London. To find out more about the history aspect visit the LT Museum website. The complexity of London's Underground system is organised on the distinctive tube map, originally designed by Henry C Beck in 1933 and based on circuit diagrams. He received only 5 guineas for the design & artwork although it has expanded with the system and been produced millions of times in numerous formats. The colour code has allocated red to the Central line. The Central line was first built in 1900 between Bank and Shepherd's Bush and extended between 1908 & 1949. It now runs between Ealing Broadway or West Ruislip to Hainault or Epping, covering a distance of 46 miles with 49 stations. Originally it used shorter trains and slightly smaller diameter tunnels but was standardised in 1938-40. During WWII tunnels between Newbury Park and Wanstead were used for the manufacture of aircraft parts. Between 1957 & 1994 there was a single track extension from Epping to Ongar, which remains the start point for measurements of the whole system. WHEN it is operational you can take the longest continous journey between West Ruislip & Epping - a distance of 34.1 miles which should take 1hr 28½ mins! You can view current information on the TfL website or investigate the history at the LT Museum website. Between the road and rail bridges at Blackfriars there remain a line of red cast iron columns that once supported the London, Chatham & Dover Railway crossing built in 1862-4 by Joseph Cubitt and F T Turner. Stopping at red lights is a common occurence in London these days but the first traffic lights to be installed were at the NE of Parliament Square and are recorded by a plaque on Bridge Street. Motorists may be forgiven for thinking they are seeing things at a Westferry roundabout where there is a traffic light tree sculptured in steel by Pierre Vivant in the 1990s. Question: Do you know why the church of St Sepulchre-without-Newgate has red and blue railings? Answer at the end. 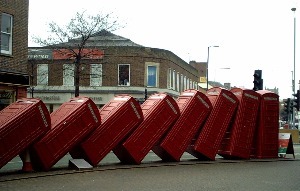 These are genuine old K6 boxes arranged by David Mach in 1989 and sited in Old London Road, Kingston-upon-Thames. Red was also the colour choice for another piece of street furniture - the pillar box. The first box in London was set up in Ludgate Circus in December 1854. I have come across examples of 'Penfold Hexagonals' designed in 1866 in Chislehurst, Chelsea, Hampstead, Walthamstow, Bedford Park & Bexley and there is an Edward VIII box at the junction of Southend Road & Brackley Road in Beckenham. Outside the Royal Hospital Chelsea is a postbox with 2 slots so that letters can be posted from both sides when the gates are locked. More information on pillar boxes is available on the GLIAS website [click here] and the Letter Box Study Group [website]. The British Postal Museum & Archive has post boxes at its store in Debden where there are occasional open days [website]. They have produced a PDF factsheet [click here]. A postal history collection at Bruce Castle Museum in Tottenham includes some letter boxes. During the building boom in the Victorian period locally-made stock bricks were cheaper than red (because of transportation costs) but were an unattractive grey/yellow colour. It was therefore not unusual to build houses in London stocks with string courses or other features in red brick or with red bricks only on the front elevation. 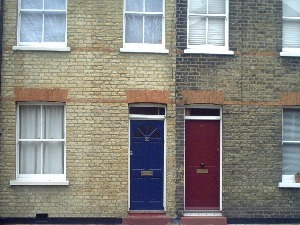 Red bricks were favoured for buildings c1880s in the 'Queen Anne' style prevalent in places like Bedford Park (pictured left). Alfred Waterhouse used red brick and terracotta for two large projects - the Prudential in Holborn and the former University College Hospital cruciform building in Gower Street. This was generously funded by Sir John Blundell Maple even when the projected costs doubled to £200,000. Westminster Cathedral was built between 1896-1903. 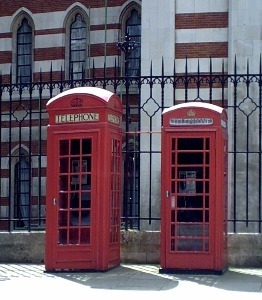 Its Byzantine style design in red brick by J F Bentley was chosen in contrast to the Portland Stone of Westminster Abbey. Another notable building which uses red bricks from Nottingham (60 million of them!) is the former Midland Grand Hotel/St Pancras Station designed in Gothic style by Sir George Gilbert Scott and built 1868-72. It was closed in 1935 and used as offices until the 1980s. 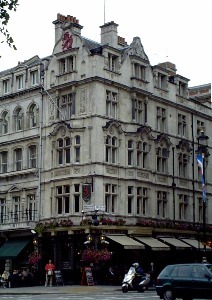 In the 1990s the exterior was restored and the building transferred to London & Continental Railways who plan to redevelop it as a hotel/apartments. The foyer and former coffee lounge are sometimes open for viewing or tours (charge) are available by arrangement. A London borough formed from Ilford, Wanstead & Woodford and named after the Old Red Bridge which crossed the River Roding until 1922. Named after an inn where the disinterred bodies of Ireton, Cromwell & Bradshaw were kept overnight in 1661. Number 17 was home to Rossetti and later Edward Burne-Jones & William Morris. The firm of Morris & Co was set up at number 8. There is a blue plaque to John Harrison, inventor of the marine chronometer, who lived & died in a house in the square and a bronze bust of Philosopher & Mathematicain, Bertrand Russell. 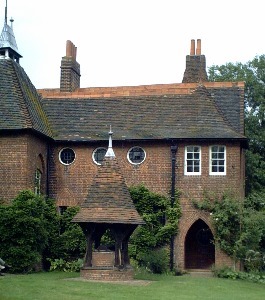 This house in Bexleyheath was commissioned by William Morris and designed by Philip Webb. Completed in 1859 it was the home of Morris and his wife Jane for 5 years during which time their two daughters were born. It became a base for artists and craftsmen, including Burne-Jones & Rossetti who contributed to the decorations and furnishings. The last private owners were the Hollomby family, who bought it in 1952, with assistance from the Red House Trust and the Friends of Red House, both set up in the 1990s. It has now been purchased by the National Trust and is open to the public (pre-booked tours only) Tel 020 8304 9878. This is a street in SE1 with several features of interest. Between Redcross Way and Ayres Street are cottages, a community hall and a garden planned by Octavia Hill on land belonging to the Church Commissioners (similar cottages pictured left). The garden has been well restored by the Bankside Open Spaces Trust. Contact them on 020 7928 5803 if you are interested in the project. To the NE of the junction with Union Street a map of 1872 shows St Saviour's National Schools and a builders yard. This was previously the site of the Cross Bones Burying Ground used by the parish of St Saviours between the 17thc and 1853. Ribbons bearing the names of some of the (mainly poor) people buried there have been tied to the gates. It was excavated and recorded by the Museum of London in 1991-8 when the Jubilee line was under construction. A history of the burial ground plus results of the findings has been published [more info]. To the NW of the junction with Southwark Street are Cromwell Buildings - Improved Industrial Dwellings of 1862 which owe their existance to Sir Sydney Waterlow, stationer & Lord Mayor. This is commemorated by pupils of Sir John Cass Foundation School in February with a service at St Botolphs Aldgate at which they wear red feathers. The school was founded in Houndsditch in 1669. In 1710 Alderman Cass agreed to provide funds but died suddenly before he could sign the deed (hence the bloodied feather quill). The school closed for 10 years from 1738 until the deed was enforced. The primary school has occupied premises in Dukes Place since 1909 and the secondary school amalgamated with the Mile End Red Coat School, now in Stepney Way. This was an open air playhouse built in 1600 which stood near present day Hayward Place, Clerkenwell. It was used by the Queen's Men until 1617 and gave illegal performances during the Commonwealth. It was re-opened in 1660 but demolished by 1665. Pepys was unimpressed by the play he saw there in 1661. The most common pub name is the Red Lion - here are 3 London ones you can try. 23 Crown Passage - tucked down an alleyway this is one of London's oldest pubs. 2 Duke of York Street - noted for its brilliant cut and acid-etched mirrors. CAMRA is not only concerned with drink but also the pubs themselves [website]. A group from Westminster Archives have produced a book 'One on Every Corner - a history of some Westminster pubs'. Their research found Red Lion pubs in Waverton Street, Russell Street, Union Street, Clarges Street, Old Pye Street, Hop Gardens & Petty France in addition to those mentioned above. There were Red Crosses in Curzon Street, Clarges Street & Tothill Street; a Red Dragon in Arundel Street and a Red Horse in Old Bond Street. In 1215 King John gave the City of London the right to elect their own Chief Justice (Lord Mayor was a later title) but he still had to appear before the king for royal approval and swear loyalty to the crown. This was the beginning of what was to become the Lord Mayor's Show. This takes place on the second Saturday in November when the new Lord Mayor rides in an elaborate gilded coach (normally kept at the Museum of London). The coachman's seat is draped in red cloth and pikemen in a red uniform walk alongside. Besides his scarlet gown the mayor has one of violet, plain black (for mourning) and black & gold (worn on civic state occassions). The crimson velvet Reception Robe is worn only in the presence of the sovereign and dates from the reign of George IV. Should he attend a monarch's coronation where he officiates as Chief Butler he would be required to purchase a special robe costing several thousands. Until the 19th century the Thames was London's main thoroughfare and 1000s of watermen in wherries provided passenger transport. The use of watermen for state occasions began in 1454 when the Lord Mayor took up his duties using a specially constructed barge. An Act of 1555 to regulate the trade led to the formation of the Waterman's Company. Their ceremonial dress includes a red hat and coat (see below). This is the oldest annual event in the British sporting calendar and was instigated by Thomas Doggett, a comedian and joint manager of the Drury Lane Theatre, who had relied on the Watermen to carry him from his home in Chelsea to his place of work, sometimes in poor weather conditions. When he died in 1715 his will provided £5 for a silver badge, weighing 12oz and depicting the White Horse of Hanover (to commemorate the ascession of George I to the throne) together with a livery including a red coat with silver buttons. The race is from London Bridge to Chelsea Pier, a distance of 4 miles 5 furlongs, and takes place in July with (originally against!) the tide. The first boats were skiffs but are now light sculling boats which average a time of 30 minutes. Men and women in their first year of freedom of the Company of Watermen & Lightermen are eligible to enter and from the 1990's unsuccessful entrants could row again in their second and third years. The original bequest no longer covers the cost of the prize which is supplied by the Fishmongers who organise the event. There is a pub named after the race at the south west of Blackfriars Bridge. In times past much of the British Army was kitted out in redcoats but now its use is much more limited. The 5 regiments of foot guards (Coldstream, Grenadier, Welsh, Scots & Irish) wear red ceremonial tunics. They usually form the guard at Buckingham Palace and a 'changing the guard' ceremony takes place 11:30 - 12:15 (on odd days in winter). In the Household Cavalry the Life Guards wear red tunics, the Blues & Royals blue. They usually form the guard at Horse Guards Parade and a daily 'changing the guard' ceremony takes place 11-11:30 (10-10:30 Sundays). They also take part in the Trooping the Colour ceremony in June [more info]. There is a Guards Museum in Wellington Barracks, Birdcage Walk which is open daily (charge). The history of the British Army is the subject of the National Army Museum in Chelsea. It is open daily and offers free admission plus a programme of talks and special events. The Royal Hospital Chelsea was founded in 1682 by Charles II as a retreat for veterans of the regular army who had become unfit for duty either after 20 years service or as a result of wounds. The buildings, designed by Sir Christopher Wren, are still home to some 400 pensioners who receive board & lodging, uniform and nursing care. Their everyday uniform is navy blue but they have a red coat for ceremonial dress which they also wear when acting as guides at the hospital. The grounds are open to the public, as are the Chapel, Great Hall and museum weekdays 10-12 & 2-4 (Sundays pm seasonally). Visitors may also attend the Chapel services on Sundays; Holy communion at 8:30am and Matins at 11am, after the Governor's Parade at 10:40. There is no specific admission charge but donations are welcome. Souvenir items and guide books are sold in the museum shop.